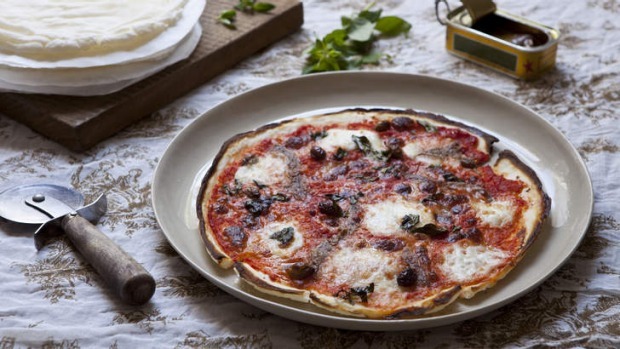 It's hard to completely emulate the classic pizza base without traditional flour, but this comes pretty close. This recipe produces a crisp base with a satisfyingly chewy texture. It's what we use at my restaurant, Mr Wolf, and it has a loyal following. 1. Preheat the oven to 180C fan forced (200C conventional). 2. Place all the ingredients for the base in the bowl of a stand mixer and, with the paddle attachment, mix at a medium speed for about five minutes to make a batter. It will have a wet consistency, rather than a typical pizza dough. 3. Spoon the batter on to a tray lined with baking paper and smooth into a disc of even thickness - about the size of a dinner plate (you can make these any size you like, of course). 4. Bake for 15 minutes (the base will cook but not brown). 5. Once cooked, cool the base and invert on to a clean tray. You can keep the bases in the fridge for a week, or even freeze them individually in ziplock bags with as much air removed as possible. But be careful, as they will be brittle when frozen. 6. Increase the oven temperature to 220C (conventional). 7. For a Napoletana pizza, top lightly with reduced passata, a sprinkling of grated mozzarella, some torn buffalo mozzarella, a few anchovies, a scattering of olives and oregano leaves, a few grinds of pepper and a drizzle of oil. Bake for five to 10 minutes or until crisp. Tip: Place a pizza stone (or baking tray) in the oven to heat through, then bake the topped pizza on the stone or tray for five to 10 minutes.